During spring break at Eureka College, high school freshmen crammed into Room 205 at Burgess Hall, where Andrea Ingwersen waits with a nicotine vaporizer, the words “It’s Not Cool to JUUL” on the screen beside her. 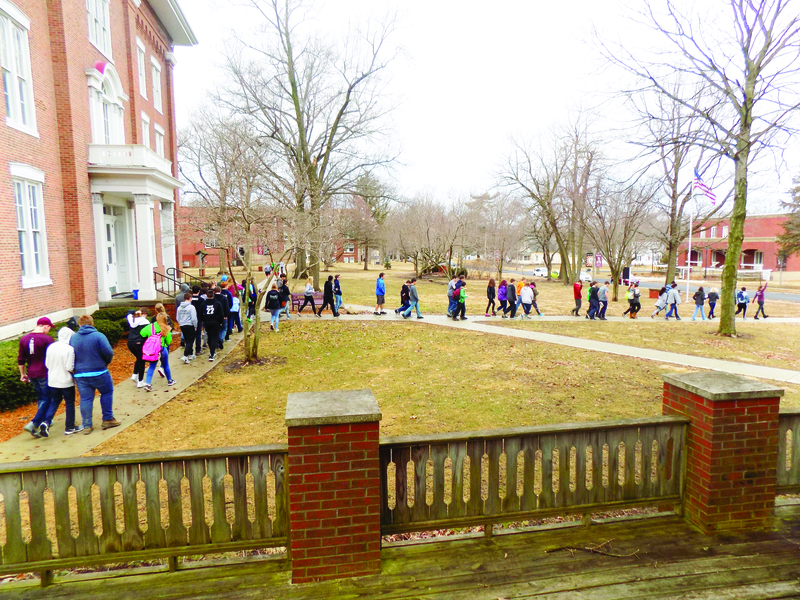 On March 13, around 400 first-year students from Woodford County’s five high schools converged at the campus for the 2019 Teen Jamboree, a one-day conference aimed at addressing challenging teen issues. The event is coordinated through the OSF Illinois Neurological Instituter’s “Think First Program”, and is hosted by the college. Four county agencies sponsor and participate in the event; University of Illinois Extension, Woodford County court services and the county’s health and sheriff’s departments. The morning began with an hour-long session, “Ending the Silence,” presented by the National Alliance of Mental Health. Afterward, students ventured off to join the first of two discussions they would attend before lunch and the closing session. The program is in its 11th year, and, in addition to giving students the chance to pick their sessions, they could scan a QR code and provide feedback after the jamboree. The matrix bar code was printed on the back of the conference schedule, and can be scanned by a cell phone. 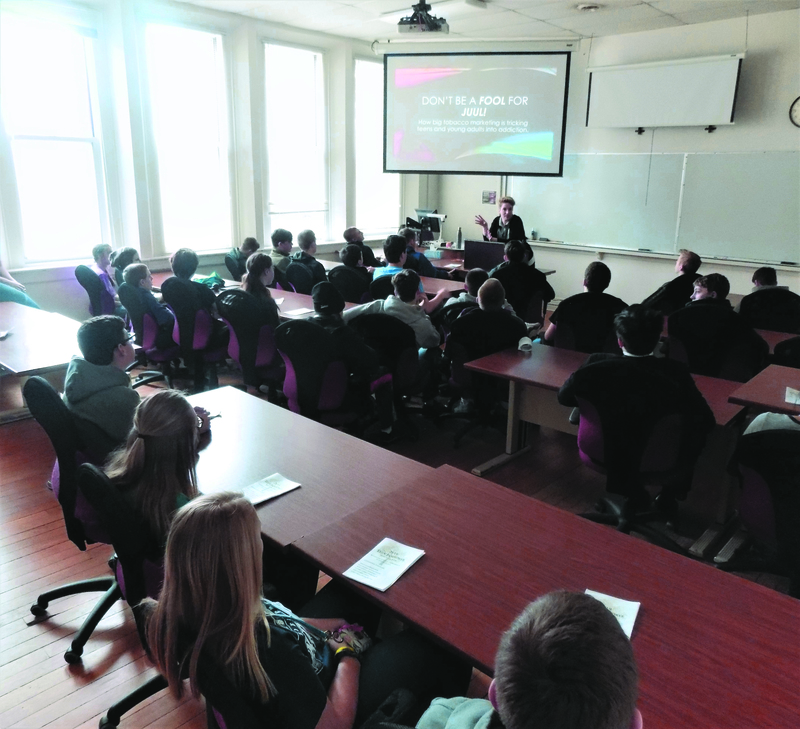 Ingwerson, the health department’s health educator, brought a JUUL nicotine vaporizer and spoke to students about the lure of e-cigarettes and the danger they pose for teens to easily become addicted to nicotine. 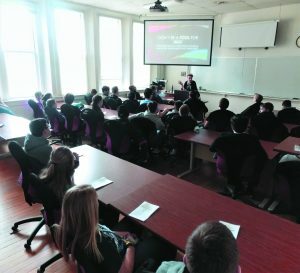 With the growing popularity of e-cigarettes, Maynard said college students volunteering at the conference have asked that Ingwersen bring her presentation back to the campus after break to address the issue returning students. Travis Guthman, owner of the Pizza Peel in Lacon, volunteered to host a session called, “Is that Text Worth It?” A few years ago, Guthman was texting and driving and wrecked his truck. The father of three underwent several life-threatening surgeries and had to learn, more than once, to walk again. Other conference focuses were suicide prevention, eating disorders, healthy relationships and preparing for college. Woodford County Sheriff’s Detective Robert Gillson hosted a workshop on the positive and negative impacts of social media. The overarching theme of the jamboree, she said, was healthy emotional, physical and mental living. After lunch, the students reconvened at the Becker Auditorium for an engaging triple-screen presentation that summarized the day’s topics. “Overall, the goal is to help teens think ahead, think things through and have resources they can depend on,” said Maynard. 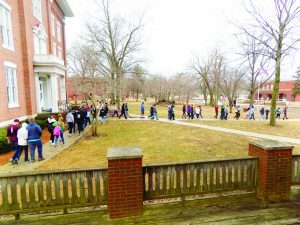 The jamboree was a collaborative effort, that included the assistance of Eureka College student volunteers, the health department’s medical reserve corps and a host of local corporate donors.